Helps keep your turf cool. Mix 50/50 with silica sand to get 2 lbs. per 1 in. pile height of turf. Description - Take your workout to the extreme with our Extreme Turf Rolls. These indoor/outdoor turf rolls are the perfect fake grass for any activity that requires cleats. With a realistic grass blade, this artificial turf will make you feel like you are playing on real grass. To truly make our Extreme Turf Rolls the ultimate field turf for your space, we recommend adding 3-4 pounds per square foot of infill. Quality infill helps with two things. 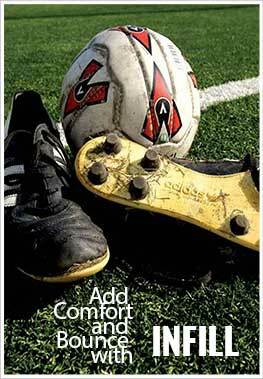 It helps to provide added shock absorption to your turf and also gives your turf bounce. These two factors are very important when practicing or playing any high impact sport or activity. Backed by a 15-year warranty, these turf rolls are great for soccer, football, and field hockey. Face Weight – 42 oz. Weight – .48 Lbs. per square feet. Recommended Uses – Our Extreme Turf Rolls are the perfect artificial turf for any indoor/outdoor application and are commonly used as turf for football fields, soccer fields, field hockey, as indoor soccer fields, for CrossFit, and much more. Designed to truly replicate grass. Drainage rate of 28 inches of rain per hour per square yard. This highly durable shape is a perfect option for those installations that need extra durability reassurance.The shape of the blade allows pressure to be exerted over several separate points, which diminishes the foot traffic impact. The M shape is ideal for landscapes that experience moderate to heavy foot traffic.